Grammar is the system that organizes a language. Grammar rules are like the traffic signs and rules of the road. The signs and the traffic rules keep the cars moving towards their destination without crashing. With a language, grammar keeps us all on the right road to our destination – clear communication. There is no way to avoid it. You will have to learn the rules if you want to learn English. But, many learners focus too much on the rules and are so afraid of making mistakes that they are afraid of trying to speak English. Don’t let that happen to you. Practicing English every day is a little like taking that same ride every day. You will be able to use the grammar rule without thinking about it. Most native speakers rarely remember the grammar rules. If you ask a native speaker about a grammar point, they may say, “I can’t tell you why. I just know it sounds right or it sounds wrong.” When you read or listen to English every day, you will train your brain to apply the rules so that the structure of the language will sound right to you. Of course you have to learn the grammar rules first, but with lots of practice, it will be easier to remember how to use them. In USA Learns you learn the basics of English grammar in 1st English Course with Ms. Marquez, the English adult education teacher. 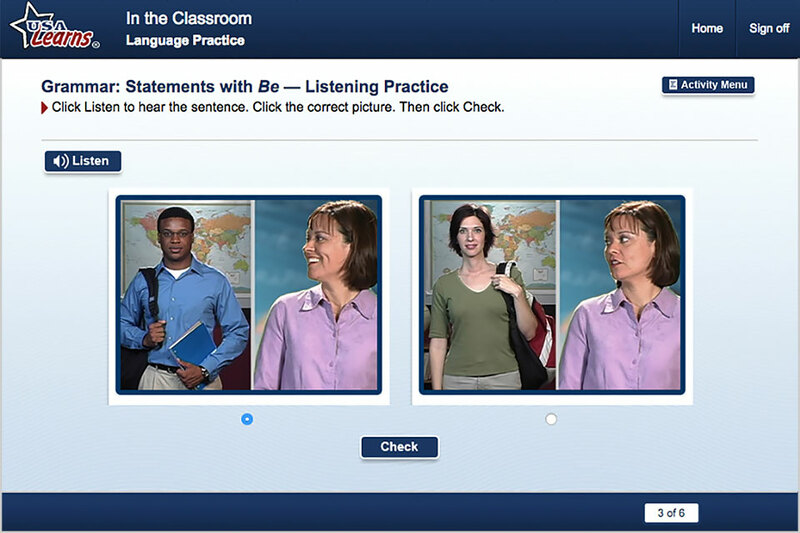 You will feel like you are participating in the class with other students who are learning English just like you. Ms. Marquez teaches the grammar lesson to the whole class with lots of examples in the Classroom Lesson video. Ms. Marquez always makes the grammar easy to understand for the class, partly because she uses many examples. 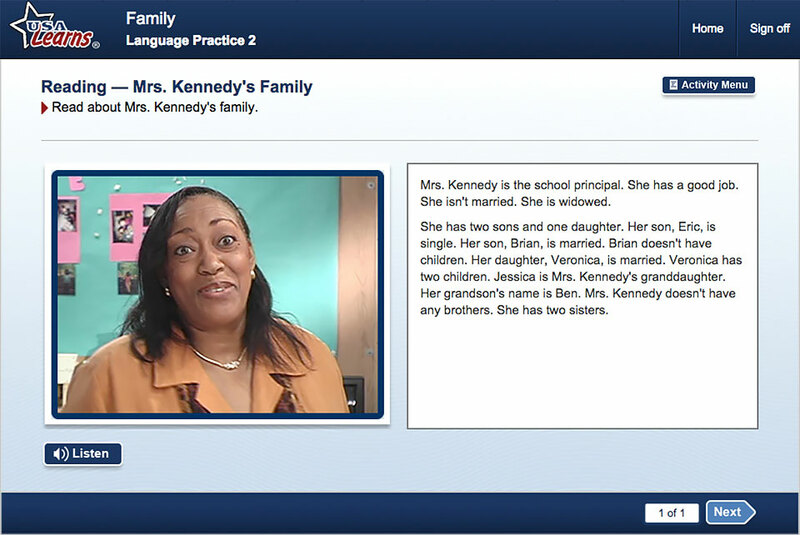 She asks questions of the students, and you will be able to practice answering! Participation is the best way to benefit from any class. So, don’t be shy. Answer the questions out loud when she asks them. In the videos you can also click to read the script. If there is something you don’t understand by listening, read the text to be clear. Practice is the key to making the language more natural to you. Rules are easy to forget, but at USA Learns you practice the grammar in a variety of activities, using all 4 skills of the language: reading, writing, listening and speaking. Remember, we want the grammar to sound right, look right, and feel right to you. After Ms. Marquez introduces the grammar point there are many different kinds of activities to help you really understand when and how to use this rule. 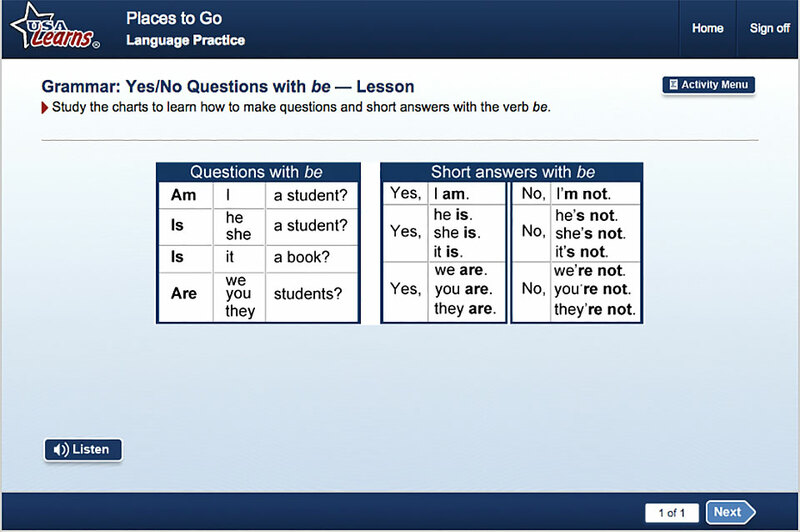 In the Grammar Lesson you will see a chart that summarizes the grammar Ms. Marquez taught in class. Ms. Marquez has already explained this and given you lots of examples. Now it will be easier to understand the chart when you think about her explanation and the examples you practiced. 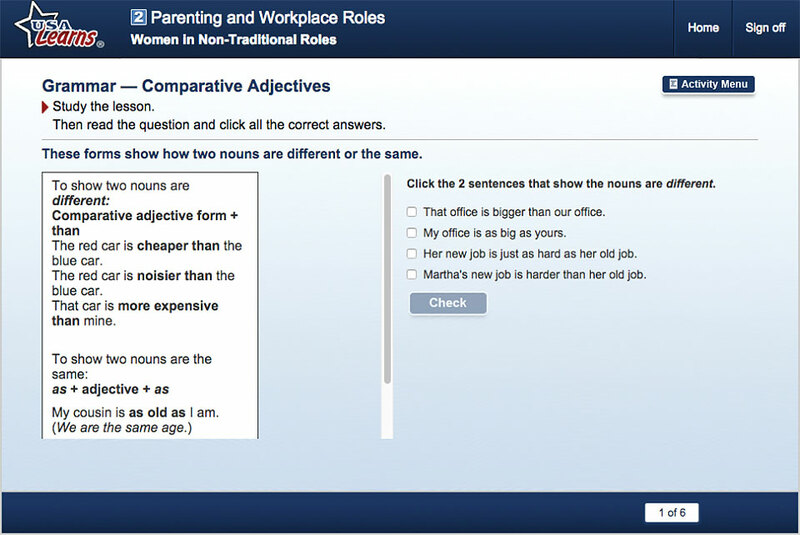 You can test yourself on the grammar with multiple choice activities. Listening is one of the most important language skills you can use for learning. Always listen carefully for grammar that you have learned. We ask you to listen and identify what you hear in many activities. In this basic lesson, look at the pictures and choose the picture that represents what Ms. Marquez says. You are showing that you hear the words, and that you know what they mean. Listening for the grammar point is something you can do in your everyday life too. Listen to people speaking English on the bus, on the radio, TV, or in a song. 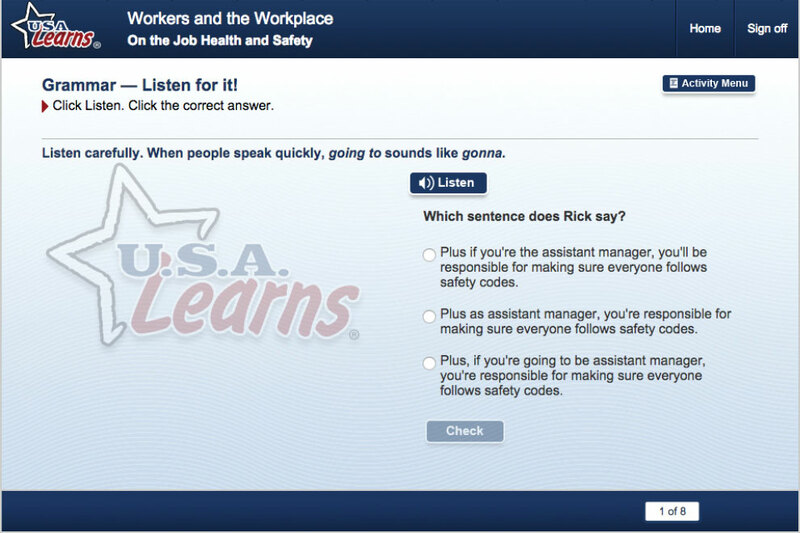 Listen for the grammar point you are learning at USA Learns. How many times do you hear it? When you become aware of the grammar people use when they speak, it will be easier for you to use it. Another good way to remember what you hear is to write it. In this activity you hear a person describe where the furniture is in a room. You have to write what you hear. 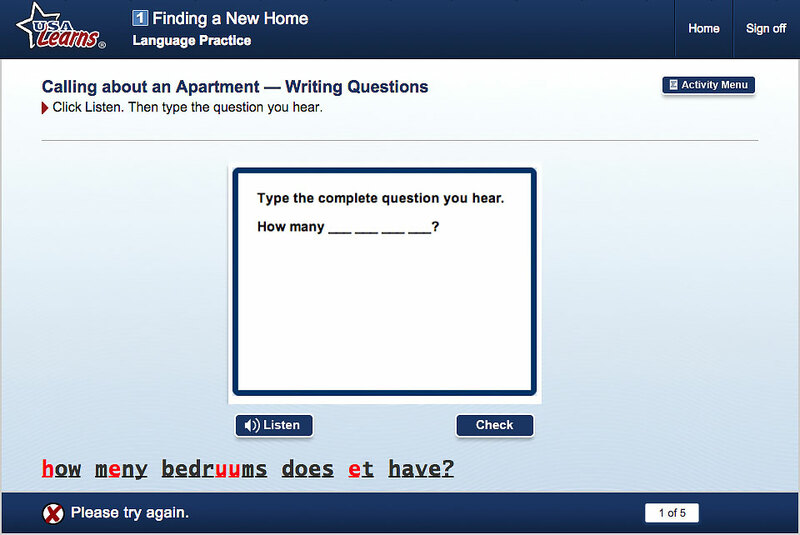 This gives you an opportunity to write the sentence with the correct preposition. Saying sentences and questions with the grammar point will help you remember how to do it when you are in conversation with others. You will listen to the native speaker, then speak into the microphone to record yourself, and finally listen to and compare what you said with the native speaker’s version. Another way to learn and remember the grammar is through reading. This is an example of a reading practicing verbs and possessive adjectives. In the 2nd English Course, your teacher is the charming and funny Wizard. He introduces each unit and tells you what grammar point you will be learning in that unit. 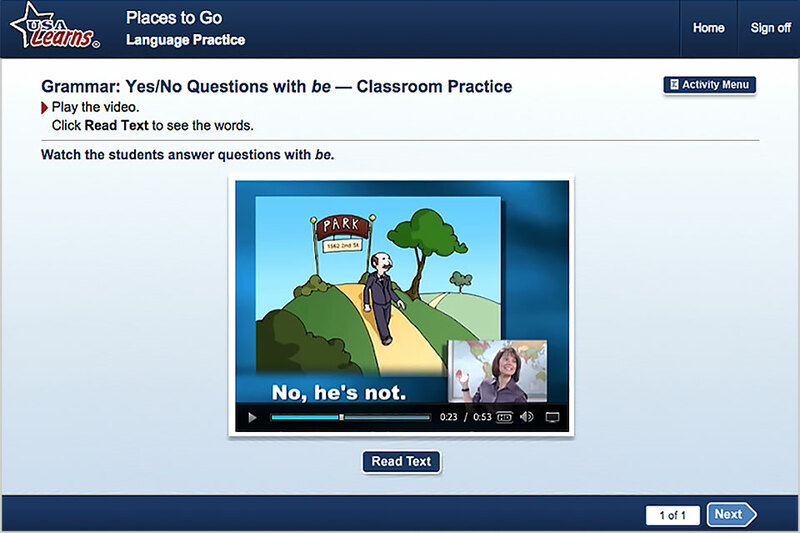 You will learn vocabulary, read and watch some video episodes before his grammar lesson. But in your reading and video episodes, you will already be getting used to the grammar point. The Wizard teaches his grammar lesson in a short video episode. Like all videos, you can click Read Text to see the script of what the Wizard is saying. 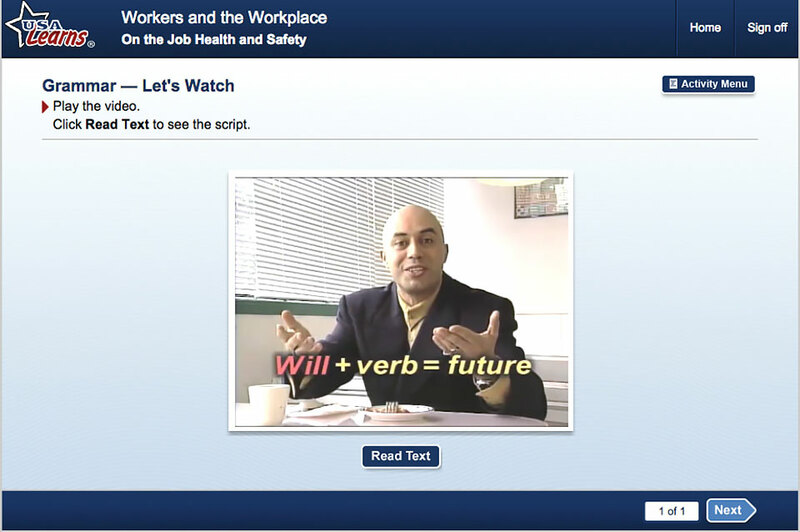 In the grammar lesson, the Wizard gives you examples by reminding you of when the characters in the video said something with the grammar point. You will see a chart outlining the grammar point after the Wizard’s video presentation. The interactive learning activities will make sure you really understand. In the 2nd English Course, just like the 1st English Course, there are many different types of practice activities for the grammar point. Maybe you can identify the correct form in a multiple choice question, but can you write a sentence in the form? Do you know how to pronounce different past tense forms? Practicing the grammar by listening, reading, writing and speaking will help you recognize when your grammar is right. 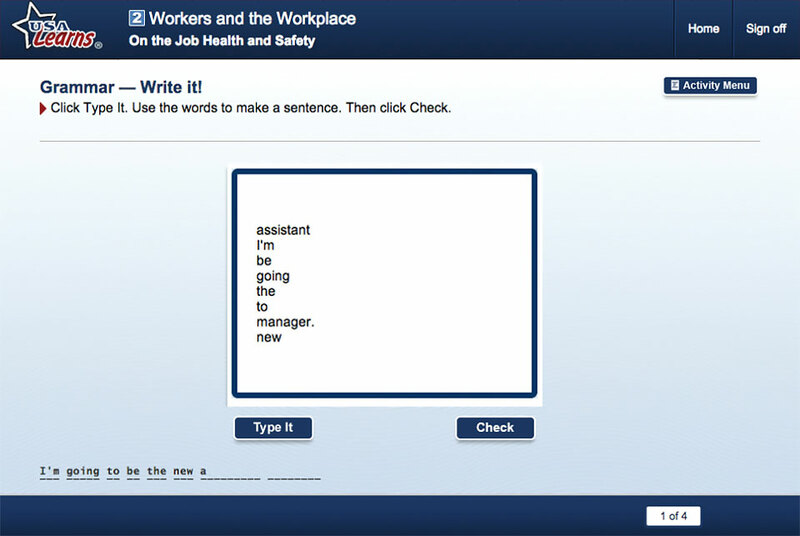 In this activity, you will need to write the sentence with the words in the correct order. Subjects, verbs, prepositions must all be in the correct order, and don’t forget the punctuation! 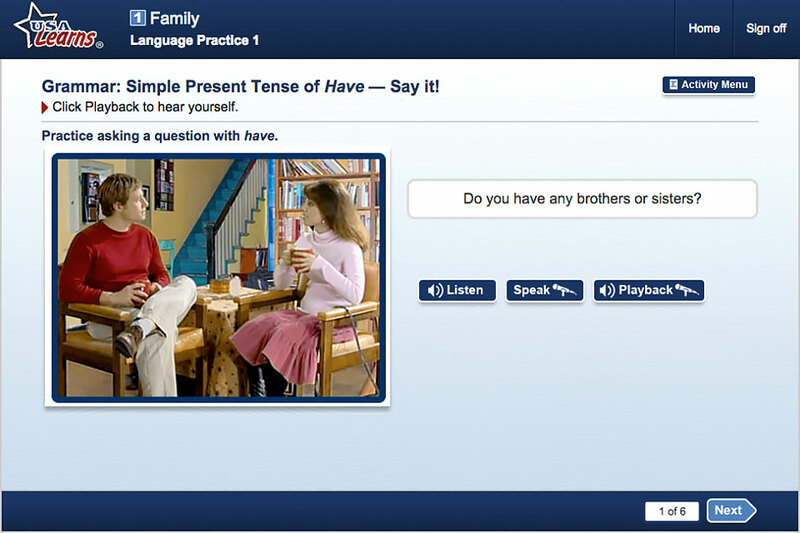 In the intermediate level, the characters use more complex sentences and they speak naturally. That sometimes means they shorten forms. You just learned about “going to” for the future tense. It’s natural that you’ll be listening for and expecting to hear “going to.” But, many English speakers shorten “going to” to “gonna.” In this activity you need to listen carefully for the spoken form of the grammar point. Speaking practice is especially important when the sound of the word can change the tense. 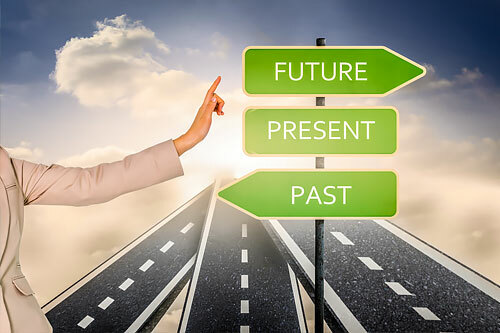 In this lesson on Past Tense, you will practice pronouncing past tense verb forms. These are just some examples of the variety of activities USA Learns offers to help you learn the grammar ‘rules of the road’ in English. 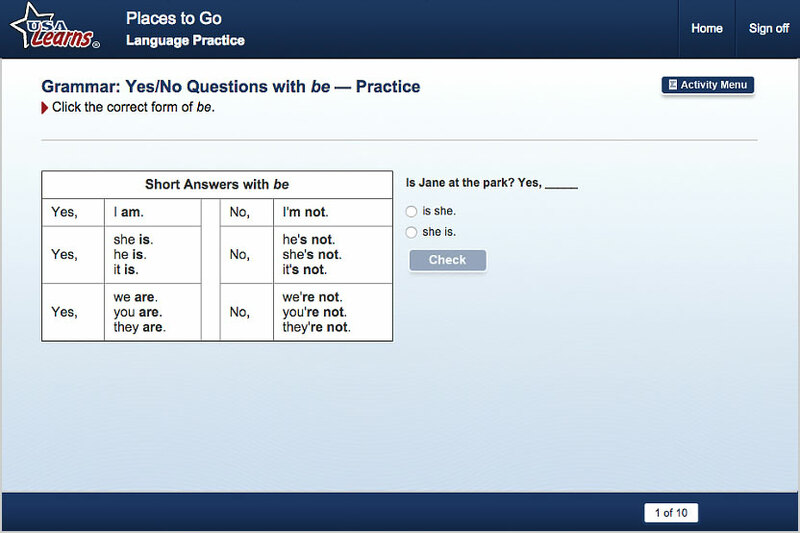 With daily practice at USA Learns, grammar will seem like a routine you don’t have to think about on your fun ride communicating in English. Learning Grammar Should Be Fun! Jason R. Levine (also known as Fluency MC) helps English learners around the world practice their way to fluency. He is the creator of the new online speaking practice program, the Weekly English Workout. 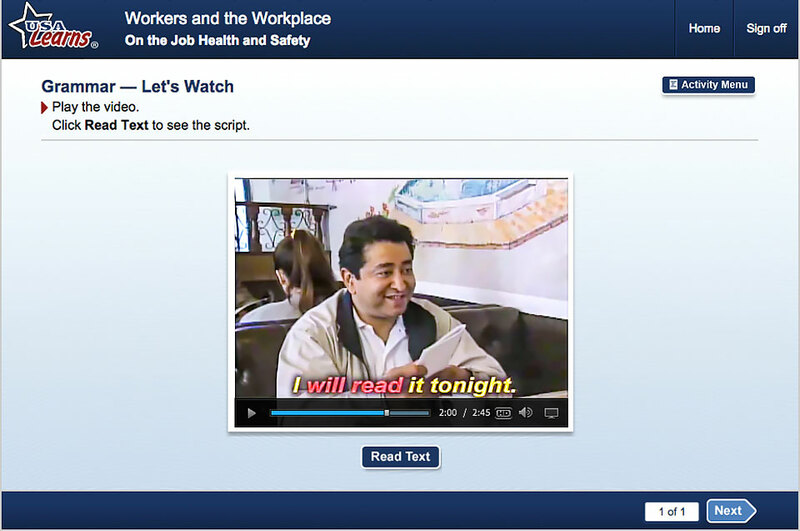 Both English learners and teachers can try his free Starter Course. Jason is currently doing Rhyme On Time student workshops at schools across Europe and teacher development with Linguaid and Gallery Languages. For further information and booking, please write to him at support@fluencymc.com. Why is it important for people to learn English grammar? Grammar is the structure that holds a language together. So, if you’re learning English, you need to learn grammar to fully understand what you hear and read and to successfully communicate what you say and write. Some people say that English grammar is difficult to learn. Is that true and why? I think grammar in English, or in any other language, is difficult to learn if you study it. I don’t recommend studying English grammar unless you plan to be an English teacher or a linguist. For most people, putting grammar “under a microscope” to study how it works has a negative effect on their progress in English. It’s boring; it creates stress; and this decreases their motivation to learn. And it causes them to think too much about the structure of the language. As a result, they are less fluent when they speak, listen, read, and write. The key to success in English is achieving a balance between accuracy and fluency. Grammar is essential for accuracy. But the important thing is that you understand it and know how to use it real situations, not that you can explain to someone how it works. What are some relatively easy and fun ways to learn English grammar? Grammar is best learned in context, from authentic materials when you are truly interested and enjoying what you are doing. It could be a story, a song, a poem, a movie clip. Do activities in English that genuinely engage you. These should be things that you want to do because they’re fun. 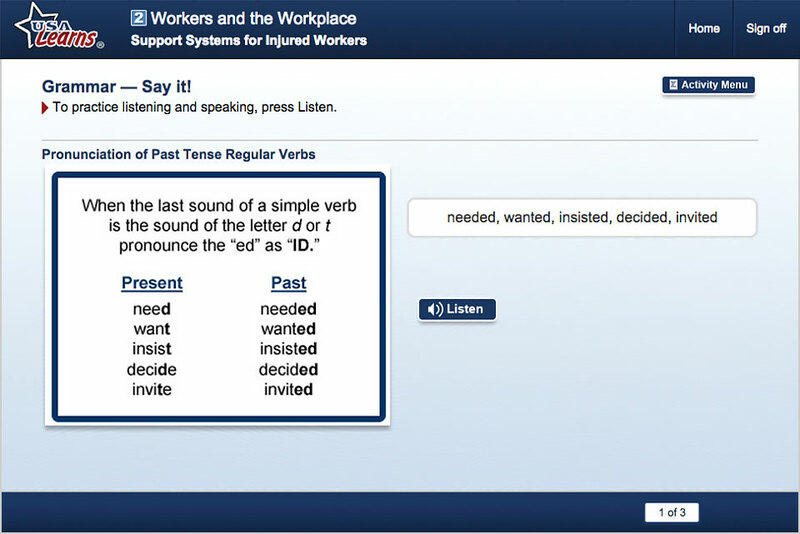 How can technology help people improve their English grammar? I think the most important thing is that it provides greater opportunities to do meaningful repetitive practice. Before digital music, you had to rewind tapes. Before video sharing sites like YouTube, you had to wait to see the same video again. With the Internet, there is virtually no limit to the practice you can get to develop your grammar. It’s repetitive practice-especially through reading and listening-that is so vital. The more you read and listen to the same materials-the same music videos, news articles, blogs, podcasts-the more likely it is that the grammar structures will naturally sink in and stick in your head. As I like to say, it’s all about the 3Rs: Relax, Repeat, Remember. REGISTER NOW to improve your English grammar with USA Learns!